It’s a Multi-cultural Experience in Downtown Silver Spring | Oh, the Places We See . . .
← Gone travelin’! Be back soon! 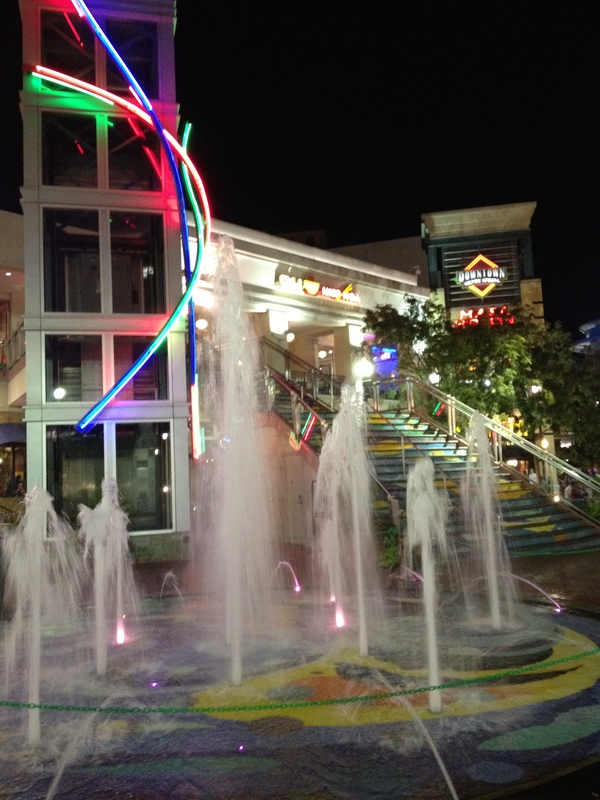 Fountains under the night lights of downtown Silver Spring. Although I’m no authority on Silver Spring, Maryland, or any big city for that matter, it was my good fortune to explore this progressive downtown area for a few days and get a feel for the people and places that make it unique. 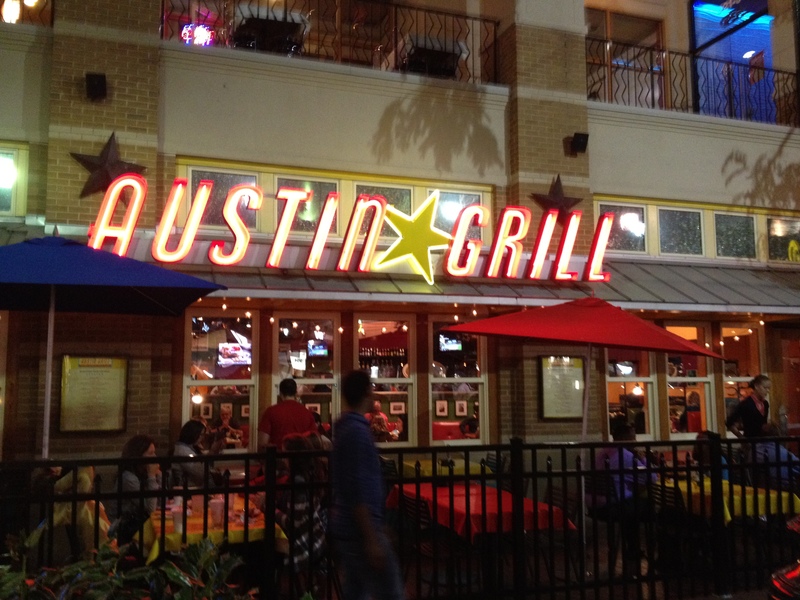 Yes, it had the usual national chain restaurants, stores we all know, and people doing the usual city things — waiting in line to cross the street, board buses, get a table, etc. But Silver Spring is different. You only have to walk a few blocks to see the concentration of interesting venues undergirding the city’s strength: Silver Spring celebrates diversity in its people and places. . . and welcomes visitors to join in the celebration! When I checked in at the Marriott Courtyard, this 1963 photo by Owen Duval greeted me as I stepped off the elevator onto my floor. 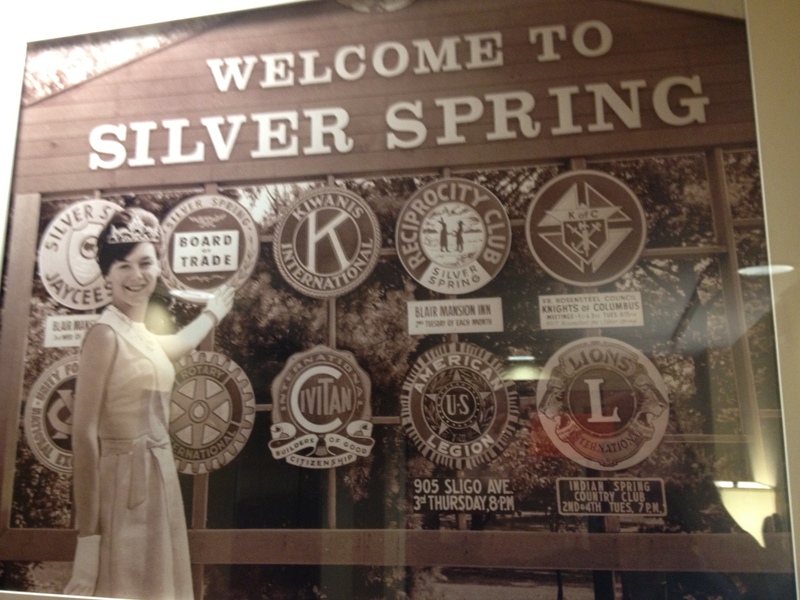 Titled “Miss Silver Spring at Jesup Blair Park,” the photo of Barbara Chamberlin was a nostalgic reminder of the Silver Spring of yesteryear. But what I found after tossing my bags into my room and then hitting the pavement was a new, classy, downtown area with international flair! It’s possible that downtown came to life after Discovery Communications moved from Bethesda, Maryland, to Silver Spring, but I have no idea. What it did do, however, was infuse the area (and now the nation — heck, the world, too) with creativity the likes of which we hadn’t seen before. My behind-the-scenes tour of Discovery uncovered not only the historic acquisitions positioned in the front hall — dinosaur bones, fossilized bambiraptor remains, a triceratops head — but also vestiges of creative genius behind the Discovery Channel and umpteen new series that have grabbed hold of American viewers: Yukon Men, Shark Week, Deadliest Catch, American Chopper, TLC, Animal Planet, and on and on and on. 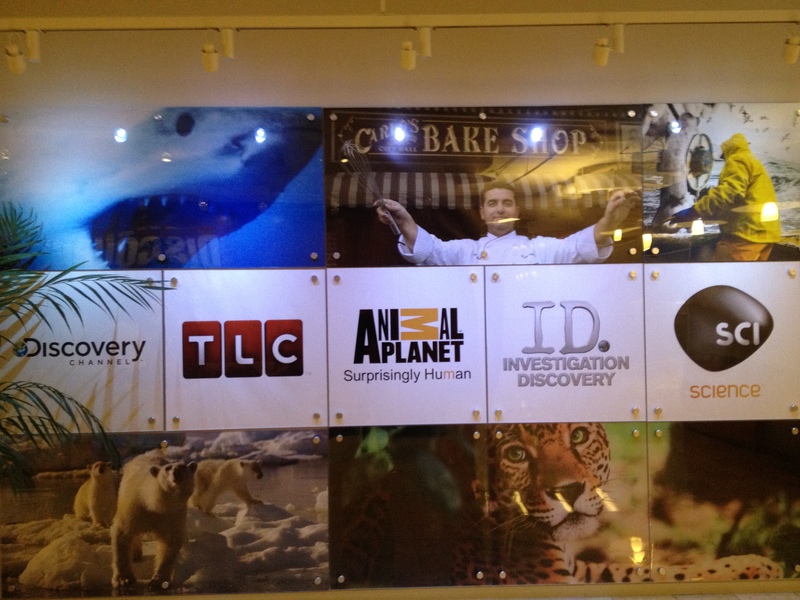 No wonder we love ’em — they’re us on screen! 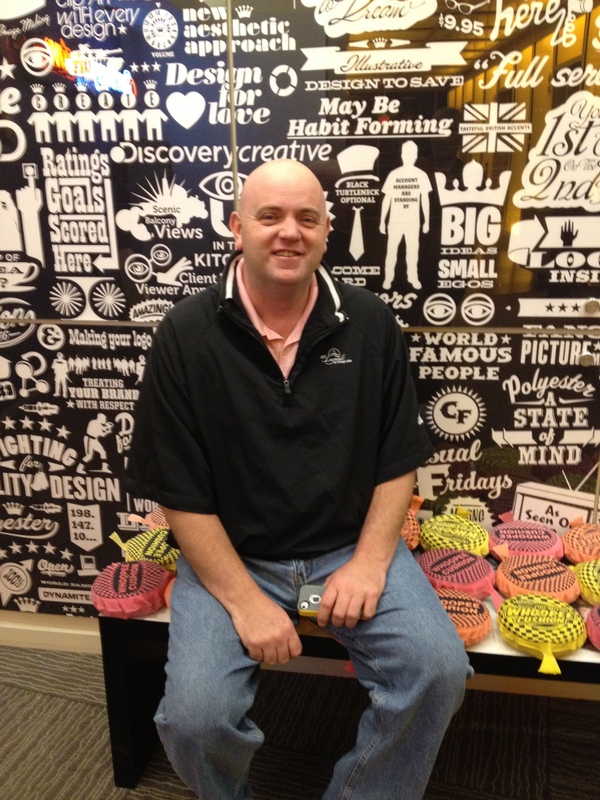 When you get off the elevator on the 2nd floor, you can do as Tom Turner did and sit yourself down on the whoopie cushion bench — a fun way to start the tour! 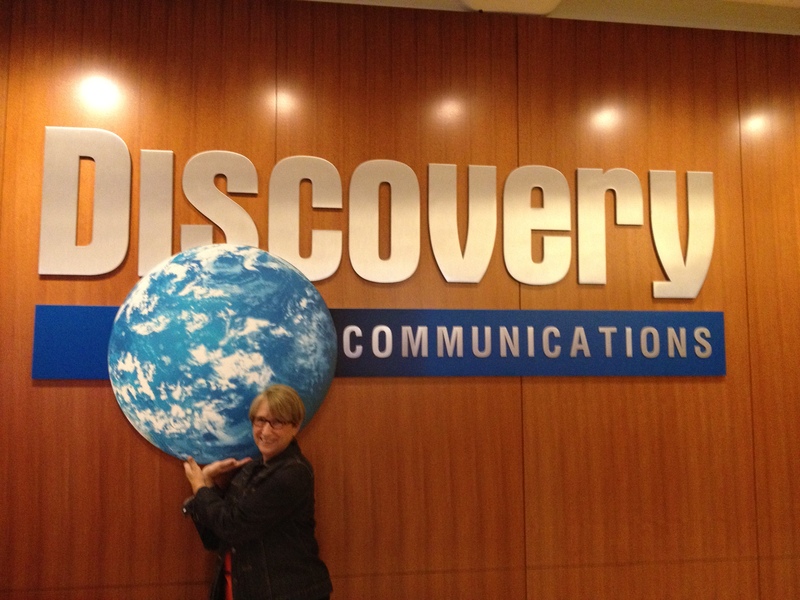 Discovery doesn’t take itself too seriously — whoopee anyone? 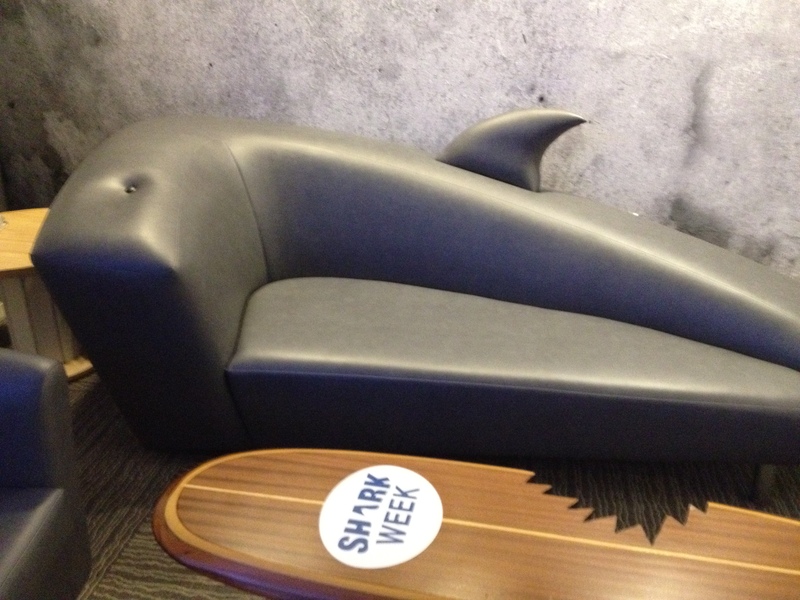 Or you can rest a while on the shark couch. And check out the bite-out table, too. 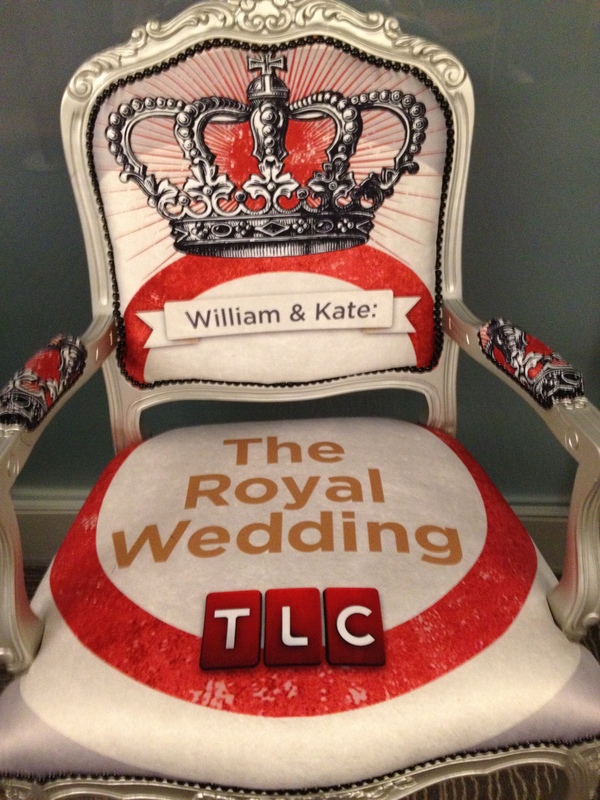 Creativity is everywhere — from cubicles decorated with Hello Kitty to life-size replicas of chopper dudes, aliens, chimps from Animal Planet, and a royal seat from TLC. Shopping, too, had that international flair — everything from ordinary to odd and then some. 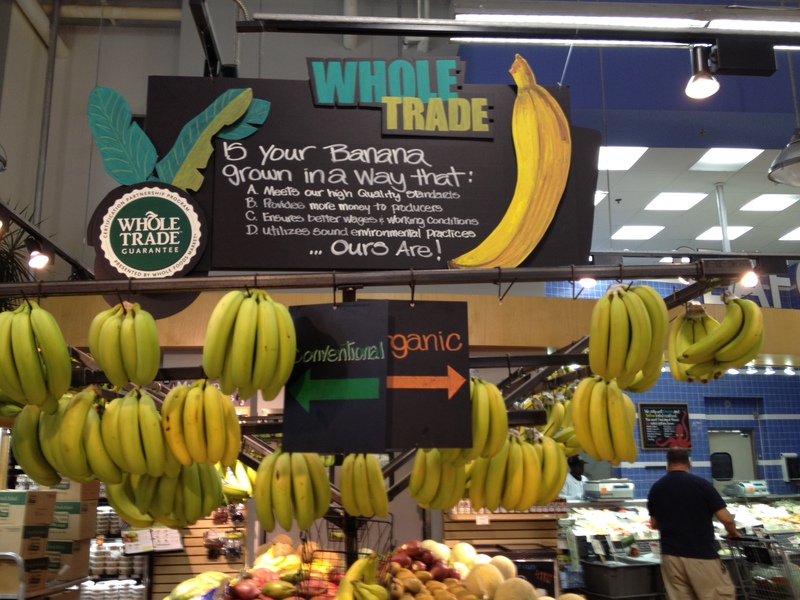 Since I’m from Knoxville and Whole Foods is coming soon, I went there first. 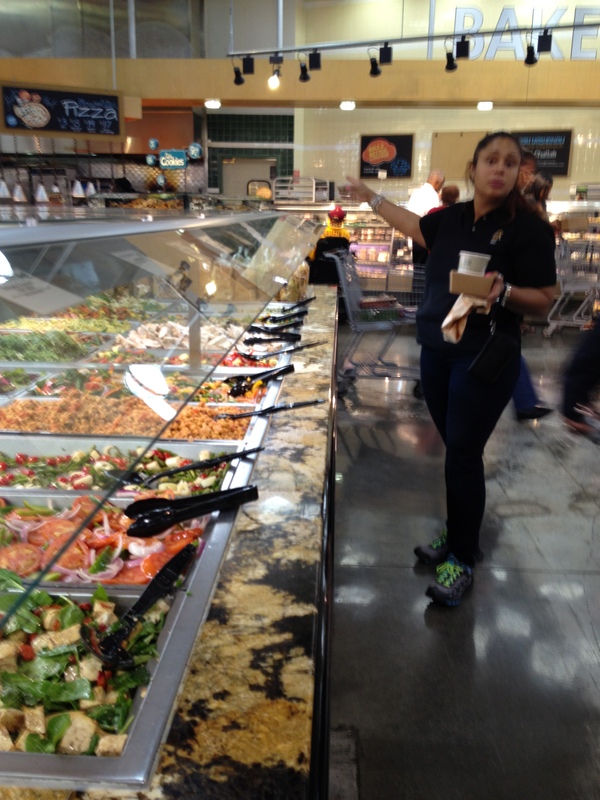 Produce, coffee, even seaweed from around the world filled the waist-high tables. And long bars boasting pans of prepared dishes catered to people of all ages and backgrounds who just wanted to try something new. 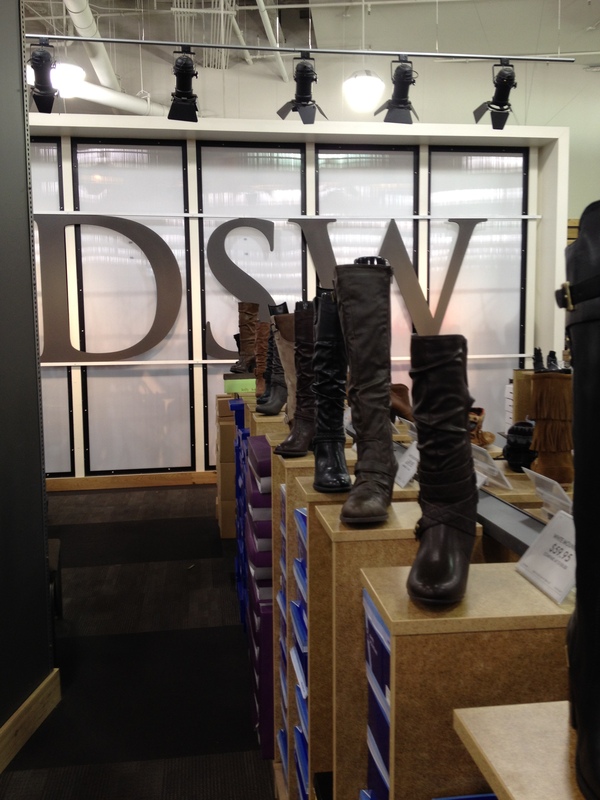 DSW Shoe Warehouse is a shoe mecca. Filled with ballerina flats, stacked-heel boots, and running shoes, this store could outfit all the feet in Silver Spring and then some. 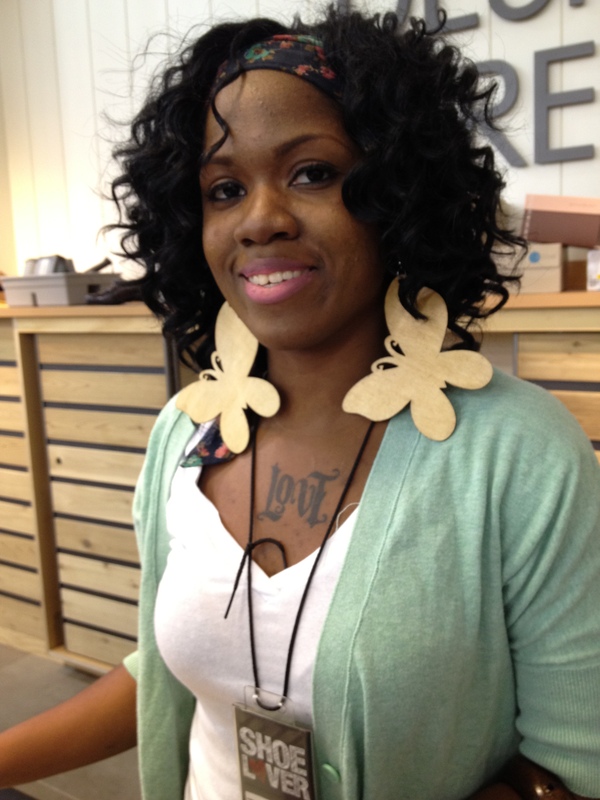 I couldn’t resist asking this saleslady if I could snap a picture of her butterfly earrings, and she was happy to comply! After all, she enjoyed being the fashionplate behind the DSW counter. Workin’ the register in style at DSW! Other places to shop include Pacers Running Store for activewear and New York & Company. On its way is H &M which should do well in this fashion-conscious D. C. burb. I crossed the street at Veterans Plaza mainly because I spotted a crowd of folks stopped at a street vendor’s stand and then others running/gathering/playing in this large open area. Two men seated at a chess board said it was OK with them if I took their picture, and I tried to capture kids on skateboards whizzing past these guys who can obviously concentrate in the midst of urban hubbub. One of them looked up at me and said, You know this is an ice skating rink in the winter, don’t you? And I replied that I didn’t, but it made sense. This downtown has a lot going for it in terms of bringing people together, and I’d love to come back and see a winter rink filled with skaters of all ages right in the heart of things. 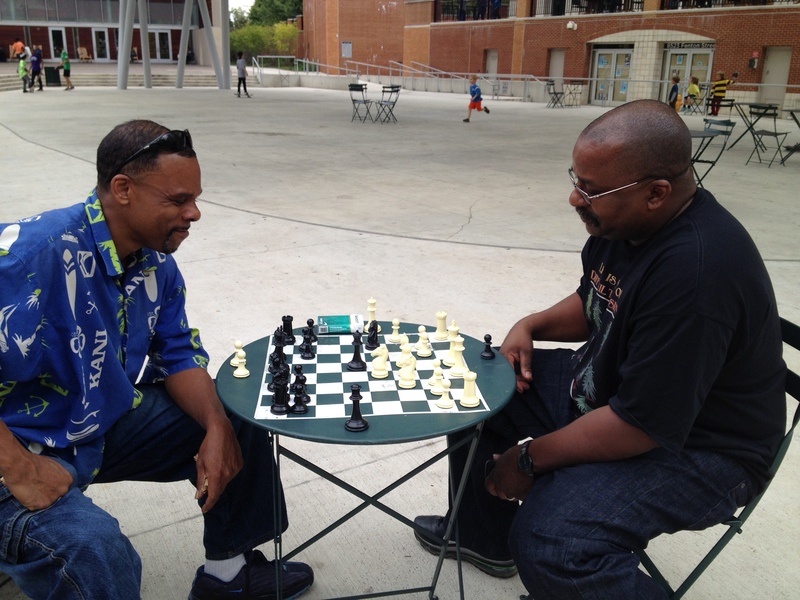 Two chess players enjoy the warm air before this area becomes a downtown ice skating rink. The AFI Silver Theatre was a find, for sure. 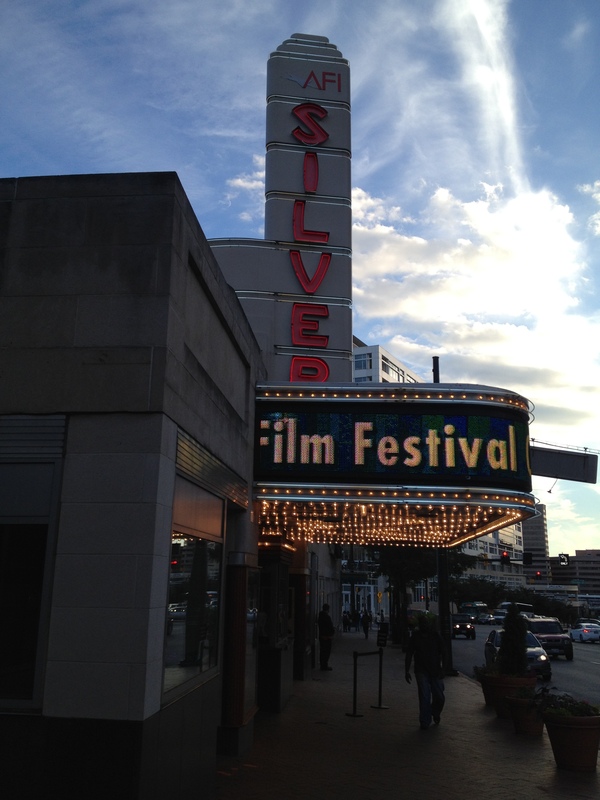 The American Film Institute (AFI) opened the old Silver Theatre on Colesville Road in downtown Silver Spring in 2003. Since then it’s been an attraction for its quality renovation and events such as the Latin American Film Festival which was in full swing while I was there. A huge movie theatre, The Majestic, looms large on the corner at Ellsworth Drive near the skateboard park/ice skating rink. 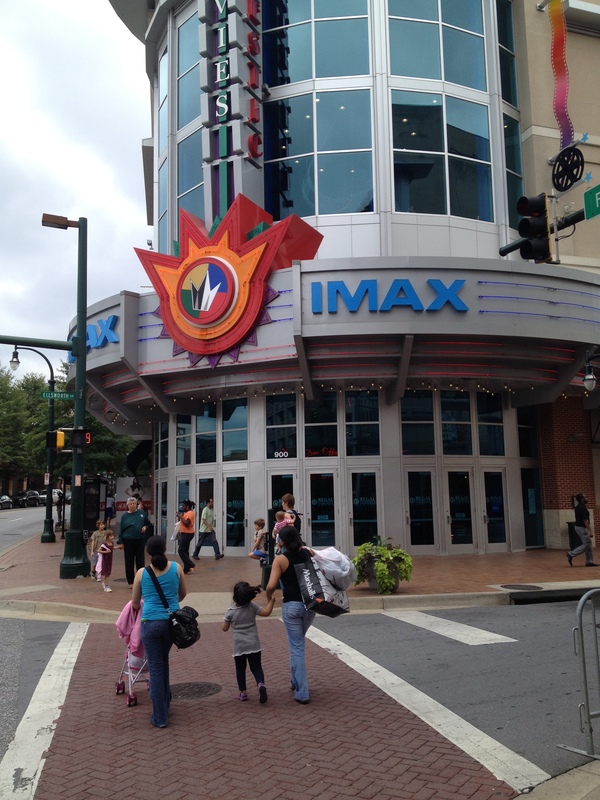 The IMAX theatre is bound to be a big hit with residents and visitors, too. But what intrigued me most was The Fillmore Silver Spring on Colesville Road near the Silver Theatre. It’s a live music venue for up-and-comings as well as already famous groups like Gov’t Mule playing there November 3rd. With a capacity of 2,000, The Fillmore serves as a cornerstone for entertainment in this community. 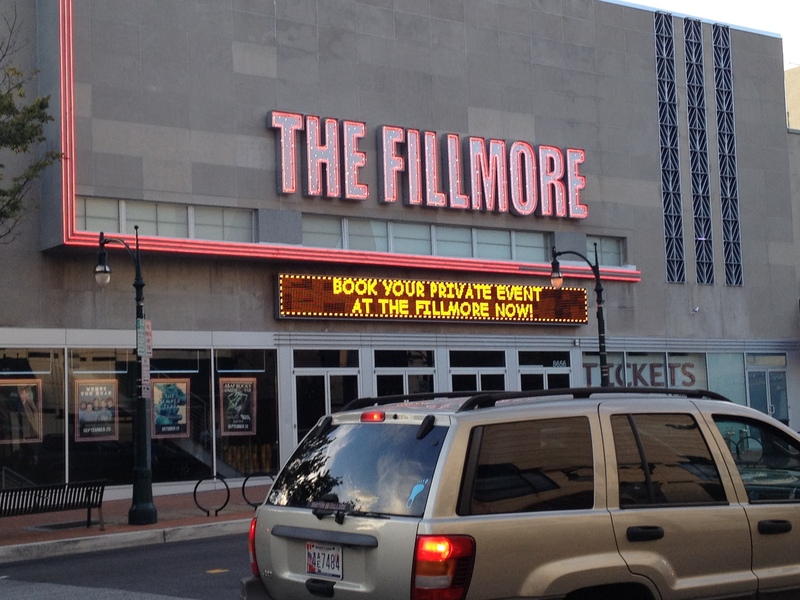 Concerts and private events fill the calendar at The Fillmore. 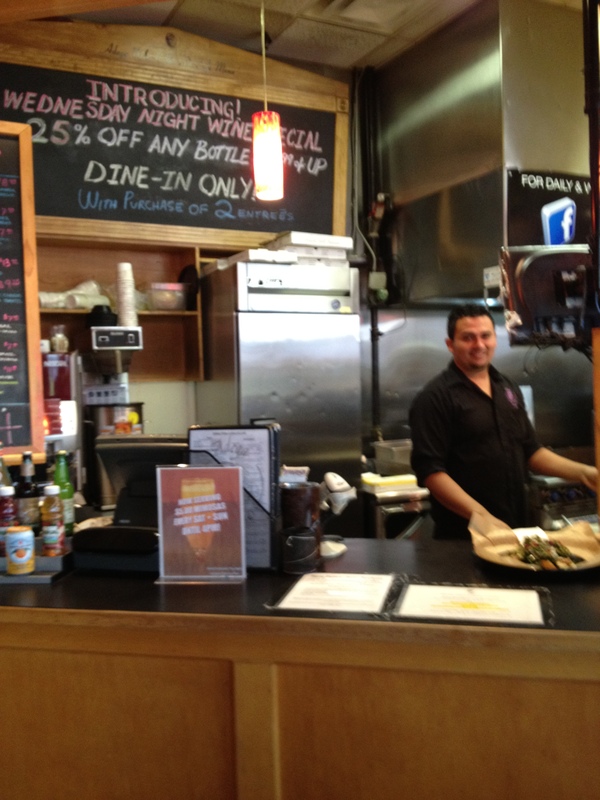 Without a doubt, Silver Spring provides foodies of all ages and all tastes a wide range of choices. International offerings can be found at Asian Bistro, Lebanese Taverna Cafe, Nando’s Peri-Peri, Pho Hiep Hoa, and Thai at Silver Spring. Thumbnails on my favorites follow below. 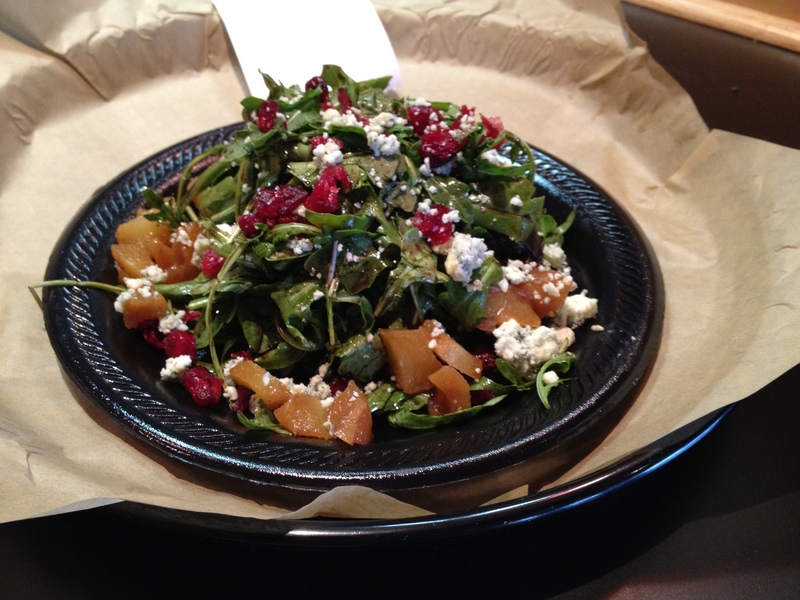 Adega Wine Cellars & Cafe can seat you in a wine cellar atmosphere while serving you Mediterranean flatbreads, Adega Fries (sweet potato fries with mango-lime vinaigrette), or my favorite — Arugula, Pears, & Gorgonzola Salad. Gourmet food in a tucked-away atmosphere! 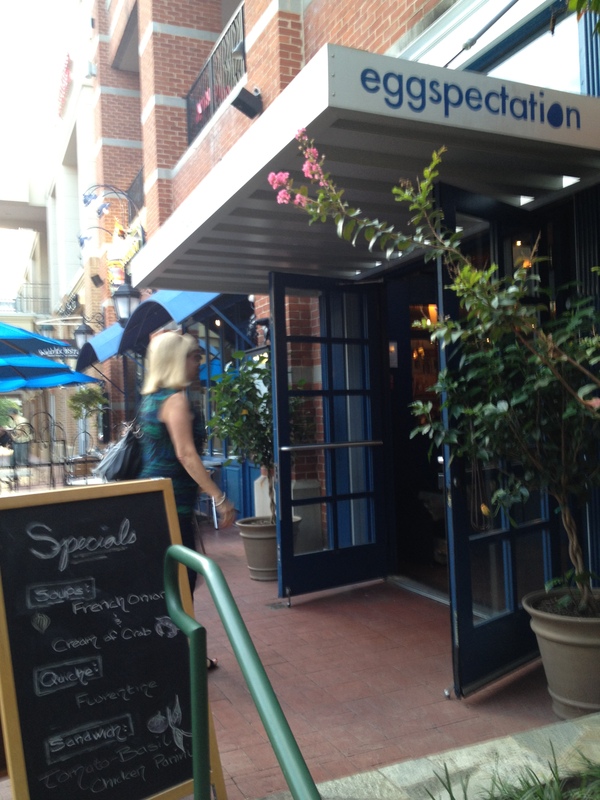 Eggspectation won the Best Brunch Award in the 2012 Best of Silver Spring Winners, but you don’t have to go in the morning to load up on three-egg omelettes or the Eggstravaganza with two eggs, two slices of French toast, Canadian bacon, and grilled potatoes! It’s around-the-clock breakfast food that’s uneggspected! Enter here for eggs benedict and three-egg omelettes — served any time! 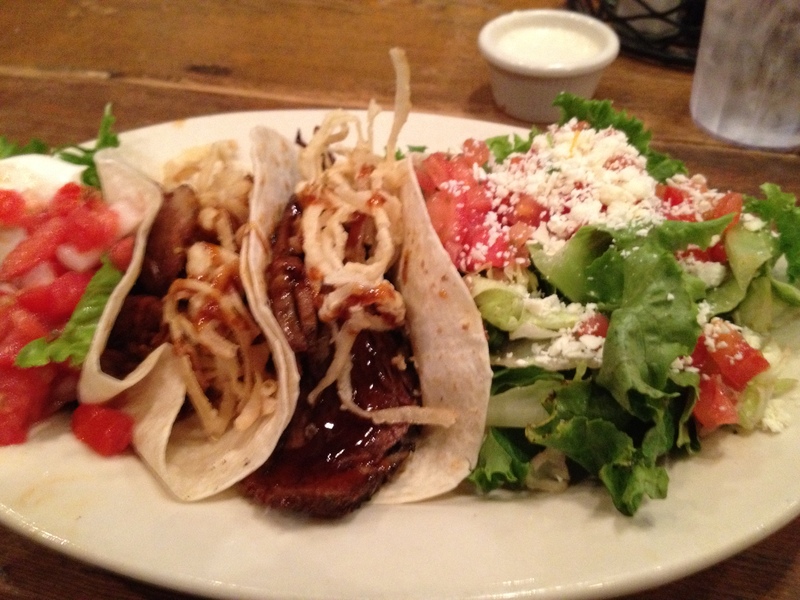 You won’t leave Austin Grill hungry if you order a Texas Brisket Taco Plate with dry rubbed brisket, tomato, fried onion straws and BBQ sauce or The Willie Nelson with four tacos: skirt steak, grilled chicken, carnitas, and picadillo. For fine dining, head to 8407 Kitchen Bar and order the house made charcuterie board with Pastrami, Bison Salami, Chef’s Terrine, Smoked Bluefish, and House-Cured Virginia Ham for starters. Then add Moulard Duck Breast or Organic Scottish Salmon as an entree topped off with Caramelized Fig & Raspberry Tart for dessert! Oyster Reef Coffee, anyone? 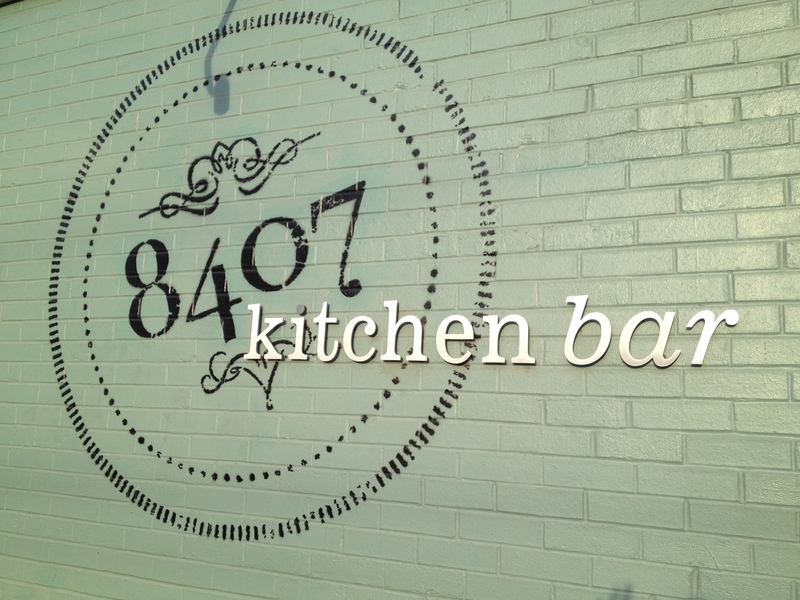 House-made charcuterie and artisanal cheeses on the menu at 8407. But if you’re just out strolling, stop in for a cold treat at FroZenYo where you fill a cup with your choice of flavors, add toppings to your heart’s content, and then pay based on weight — of the cup, of course. Not what you weigh after indulging! Shannon Gaumer fills her cup to the brim with great frozen yogurt! If I’m lucky enough to return to Silver Spring on a weekend from April to October, I’ll head to the Fenton Street Market on the corner of Fenton & Ellsworth — a fun, multi-cultural street fair featuring local vendors set up on the sidewalks selling everything from glass beads to straw hats. 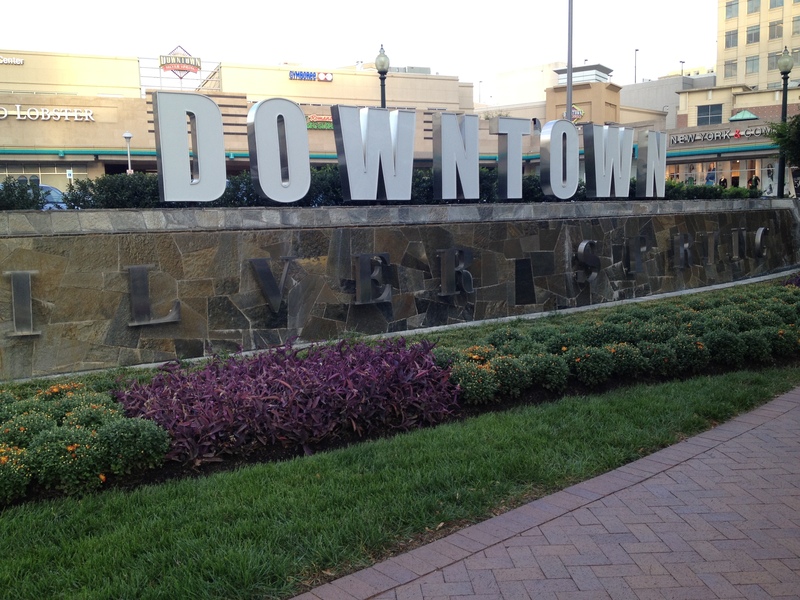 Silver Spring, Maryland, pulls people downtown — just for the fun of it! 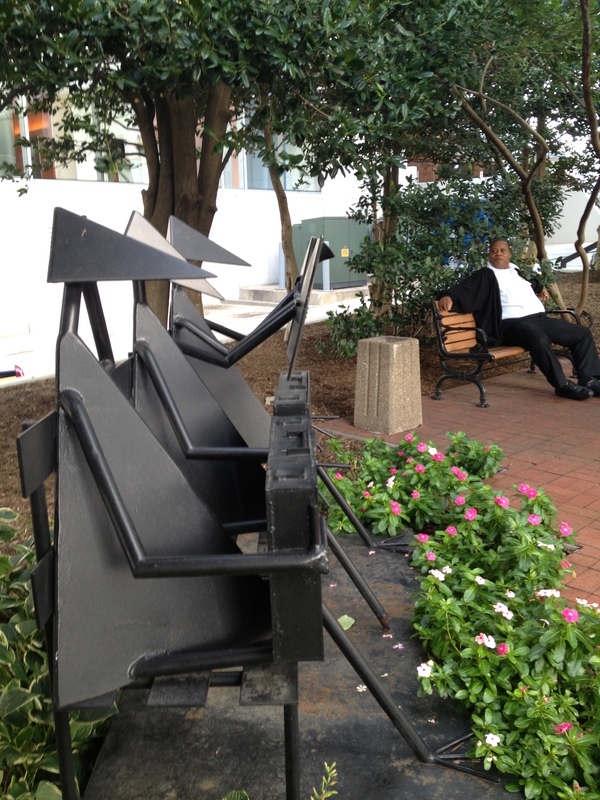 A resident enjoying one of the many sculptures in the parks of Silver Spring! This entry was posted in Destination, Farmers Market, Festivals, Food, Restaurant, Retail Shops, Travel and tagged Breakfast, entertainment, food, global, grocery, multi-cultural, music, restaurant, seafood, shopping, skating rink, street fair, travel, TV. Bookmark the permalink. That looks so fun! I lived in MD for a few years, but it was all about school at the time. The sights and foods there all look delicious! And I can just hear those whoopie cushions, lol! Welcome home, Rusha! I wondered where you were traveling – now I guess I’ll find out! 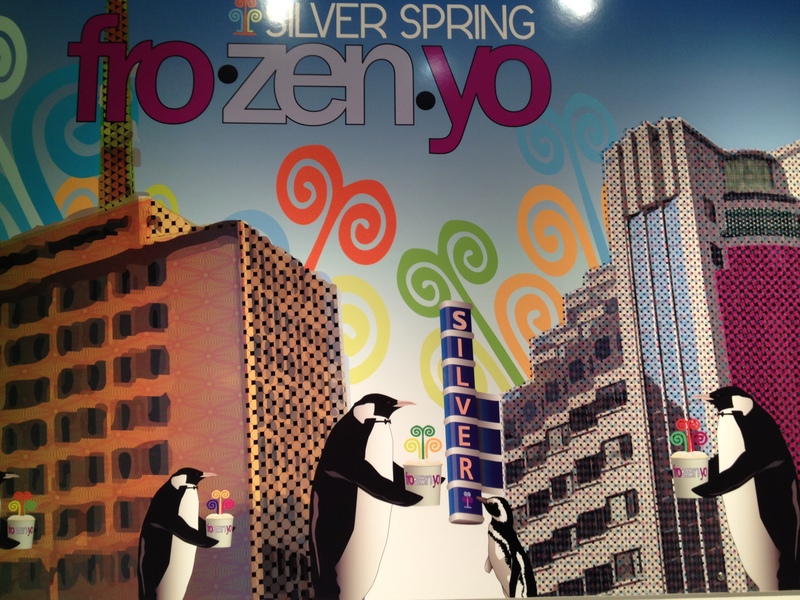 Never been to Silver Spring, but it looks like fun! Can’t wait to see what your other stops were.